This post is not for those easily frightened by dangerous, wild animals. take a deep breath before you proceed to scroll down. Aren't ya glad I warned ya?!?! Now, is not the time to go change your 4396508 water filter. You can do that after joining Camera-Critters! So, click on the badge at the top of this page and join in the fun! Cute and funny post and photo! Hahaha! very fumny. Look at that..relaxing? You are too funny! Love this shot! LOL. These wild critters really scared me. But I've had a real predator in my garden this week! OH my Gosh! That was so cute! I must admit, Matouk fascinates me. How old is he? Do you know where his wild ancestors lived? That is the cutest post and oh what a great photo. Sure looks comfortable!!! Thanks for starting my day off with a smile. Awesome :D So cute shot. My entry this week, in HERE. I hope you have time to visit as well. Thanks. That is a nice shot and he feels so relax LOL!! Did you ever ride a carabao? Very scary! Princess sleeps like that too! So like my pooch! In fact...She chooses where she wants to be and then I get what is left over! And, I am serious! LOL, that is one mean looking bear. Misty~ HAHAHA...that was the best precurser to a Great Shot! 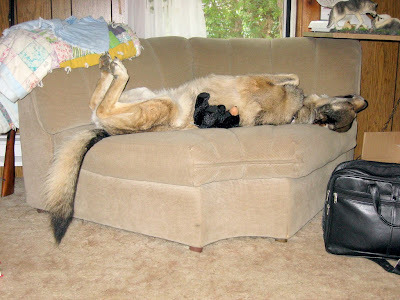 Loved the tail over the side of the couch....funny how bear assumed the same position too! You crack me up! That is so cute. awesome shot...i was really scared not until i scrolled down.